Today, just like every Wednesday, Folia Magazine welcomes a new Mulier Clara: the spotlight this week goes to Ceres, the goddess of agricultural fertility. In accordance to her patronage, the deity is often depicted holding a scythe and surrounded by ears of wheat. 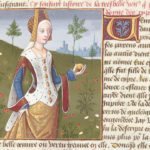 Ceres’ name finds its origins in the Indo-European root –kehr (to satiate, to feed), which is also the root for the Italian verb “crescere” (to grow) and the English “to create”: the goddess is in fact considered the protector of crops and agriculture. According to her worshippers, moreover, it was Ceres herself who taught men how to work the earth, thus helping the progress of human society. 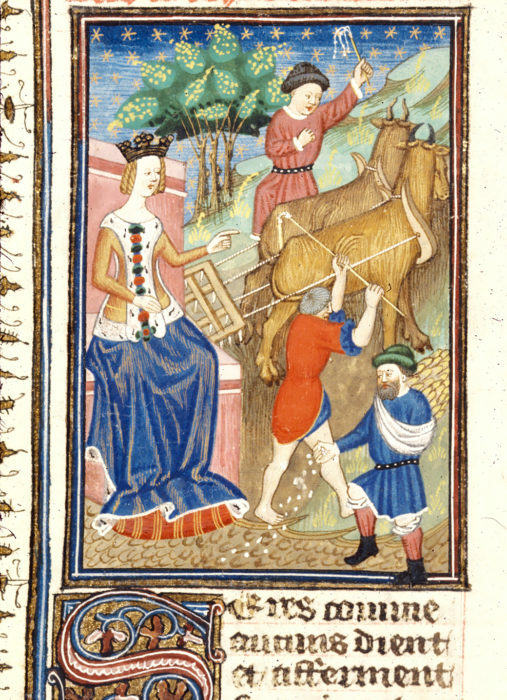 In the De Mulieribus Claris, Boccaccio describes how the growing use of agriculture heavily improved people’s lives: evolving from mere “brutes” into civilized men, humankind was able to transform wilderness into beautiful fields and rich cities. The author, however, points out how the invention had also a collateral effect. 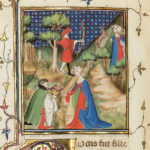 Boccaccio states that the subdivision of fields eventually led to private property and, later on, to the disparity between classes: richness, sloth, and lust on one side, servitude, poverty, and hunger on the other. 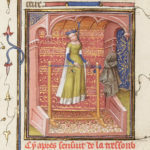 “Ceres”, illumination from the manuscript “Le livre de femmes nobles et renomées”, ms. Royal 16 G V, f. 9v, ca. 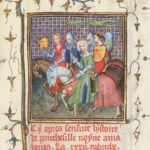 1440, British Library, London. Come ogni mercoledì la nostra pagina dà il benvenuto ad una nuova Mulier Clara: oggi è il turno di Cerere, la dea della fertilità dei campi solitamente raffigurata con in mano una falce e circondata da spighe di grano. Il nome Cerere trova origine nella stessa radice indoeuropea –kehr (saziare, nutrire) da cui derivano i verbi “creare” e “crescere”; la dea è infatti considerata la protettrice dei raccolti e dell’agricoltura. I suoi devoti credevano inoltre che fosse stata Cerere stessa ad insegnare agli uomini come coltivare i campi, favorendo così il progresso della società. 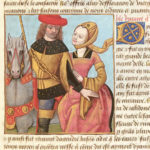 Nel De Mulieribus Claris Boccaccio illustra come l’avvento dell’agricoltura abbia migliorato la vita degli uomini, che da “rozzi” diventarono “civili”, trasformando terre selvagge in bellissimi campi e ricche città. Lo scrittore, tuttavia, sottolinea come questa innovazione abbia avuto un effetto collaterale. Secondo Boccaccio fu infatti la divisione dei campi a portare alla proprietà privata e con essa alle disparità: ricchezza, pigrizia e lussuria da un lato, servitù, povertà e fame dall’altro. 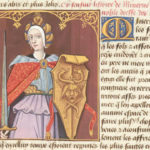 “Cerere”, miniatura tratta dal manoscritto “Le livre de femmes nobles et renomées”, ms. Royal 16 G V, c. 9v, 1440 circa, British Library, Londra.